Self-portraits of medieval book artisans are as exciting as they are rare. In the age before the modern camera there were limited means to show others what you looked like. In the very late medieval period, when the Renaissance spirit was already felt in the air, some painters made self-portraits or included themselves in paintings commissioned by others. Stunningly, the medieval painter Jan van Eyck showed himself in the portrait of Giovanni Arnolfini and his fiance: he is staring at you from the mirror that is hanging behind the couple. 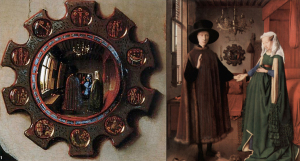 For those who still didn’t get it, he painted above it Johannes de eyck fuit hic, “Jan van Eyck was here” (Fig. 1, more here). He added the date 1434 to the picture, making it a particularly early selfie.